The Tablelands Musicians are coming together in Atherton in support for the family of Toyah Cordingley. Toyah was the beautiful young girl who was murdered in October 2018 while walking her dog at Wanghetti Beach. Toyah was 24 years old, a young vibrant, carefree woman who loved animals, nature and health. The family want to keep her story alive and to keep people talking and especially to keep awareness out there to help solve this crime. The person responsible is still at large which may lead to other women being at risk. 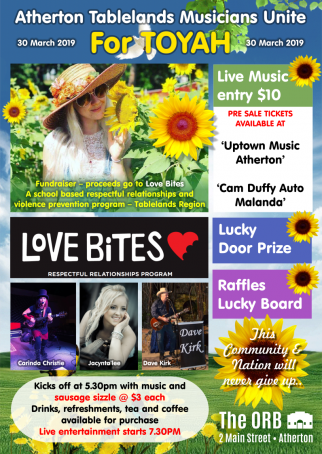 Toyah’s Aunty Michelle Broomhall who lives in Atherton is organising a fundraiser with proceeds to go to The Love Bites Program. A school based respectful relationship and violence prevention program across the Tablelands region. The support for the program will go towards helping young people to be aware and hopefully lead to this not happening to someone else within our communities. Justice for Toyah and assistance to the community in the violence prevention program is the wish of Toyah’s family. Tablelands Musicians have offered to help with a special night of music with some of the Tablelands best. Jacynta’lee, Carinda Christie and Dave Kirk have come together to bring you a night of music from the heart for Toyah and community awareness. They stand together with Toyah’s family and their neighbouring region Cairns to bring awareness in communities. A great night has been organised with a Lucky Door Prize, sausage sizzle, raffles and a $100 board have been organised for the night. Toyah wristbands and stickers will be available on the night. Tickets available at Uptown Music Atherton and Cam Duffy Auto Malanda before the event. Saturday 30th March at The ORB Tablelands Music Lovers 2 Main Street Atherton Doors open 5.30pm Music 7.30pm.